between the 8th of February 1778 and the 21st. of January 1872. I then ordered the films and started going through them adding the data that you don't find on-line ..
e.g. "was a quaker" or "the father is the son of.."
I have now finished transcribing the christening records between 8th of Feb. 1778 and 26th of Dec.1813. the Bishops Transcriptions and the Chapelry Transcripts. 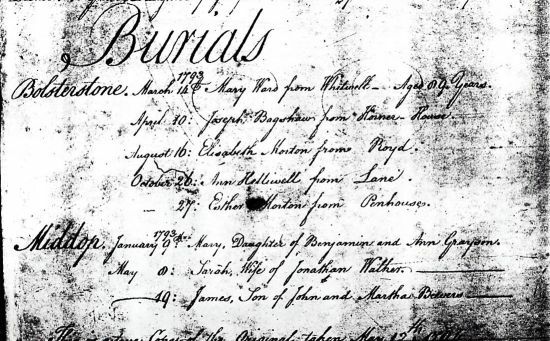 The on-line record only says "mother Ann"
The Bishop's Transcripts say "natural daughter of Ann Haigh of Deepcar"
"born on 7th August 1780, the father was Benjamin MATTHEWMAN"
and Midhope Chapelry ... they are quite mixed up e.g. "This is a true copy of the original taken May 12th 1794"
The "not green" have been extracted from the Bishop's Transcripts of just the Bolsterstone Parish Records. (until you look at the original records) whether the christening actually took place at Bolsterstone or Midhope. If you need help on the site ... have a look at my How to.. page. the births, marriages, burials and census information to form families and will, one day, have an enormous Bolsterstone Family Tree. PLEASE: check the original records, I may have made mistakes ! Formally known as The Church Of The Latter Day Saints , informally as the Mormons. Their belief that they can posthumously baptize relatives into their church has led them to a world wide search of Parish Registry books. The information they find is available for anyone (whatever their religion) researching family history. It has been filmed and is stored in Salt Lake City. Part of their research has been on-line since June 1999 and has million hits a day !